Slip-on: Slip-on shoes are the easiest to get on and off, and their minimalist design helps strengthen your feet during training. Some climbers prefer them for thin cracks, but they’re generally not favored for difficult face or slab climbs. 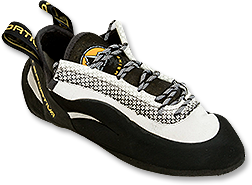 Hook-and-loop: Hook-and-loop shoes also come off quickly, which is great when you’ve chosen a tight, aggressive fit for hard boulder problems and short, steep routes. Lace-up: Lace-up shoes take the most time to get on and off, but they offer a more customizable fit. This is especially nice on long routes and for feet that tend to swell. 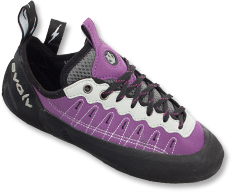 A great all-around shoe with a low asymmetrical curvature, excellent for untrained feet or long multi-pitch trad climbs. 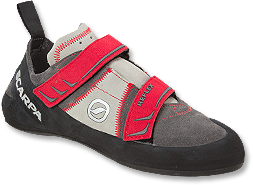 The hook-and-loop closure eases ons and offs, and the suede upper will stretch up to one half size after a few weeks of regular climbing. 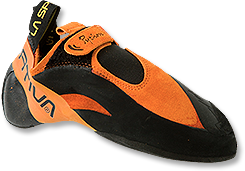 This comp-ready shoe features an aggressive asymmetrical curvature and sticky toe rubber for magnet-like attraction to those tiny nibs in the cave. Crank down the elastic hook-and-loop closure strap for a super snug fit. A stupidly aggressive downturn and beaklike toe make this an awesome tool for sticking to roofs and overhung problems. 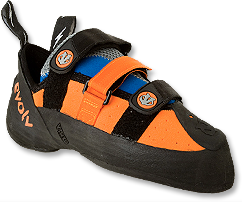 With Chris Sharma’s input, Evolv gave this shoe three hook-and-loop straps to really lock your foot in place and added a “love bump” in the toe to eliminate dead space. When you can’t find any feet, this shoe’s smearability provides peace of mind. 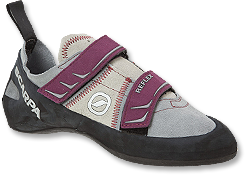 Its low asymmetrical curvature, leather footbed, and classic lace-up closure provide comfort for all-day climbing and long routes.